Monday April 13: Chilly wind this morning, but I take time to rearrange the rocks in the fire ring before I build a campfire. The new arrangement is to be both more functional and more attractive – a creative statement to begin the day. I make my cup of morning coffee and sit in the sunshine at the picnic table to write in my journal. After breakfast, while Clifford is on the phone with a computer client/friend, I walk up the road on the other side of the creek. It is steep and I’ve seen several vehicles rev their engines and spin their tires getting up the incline. On the map it looks like it goes to a butte, maybe a mile away. 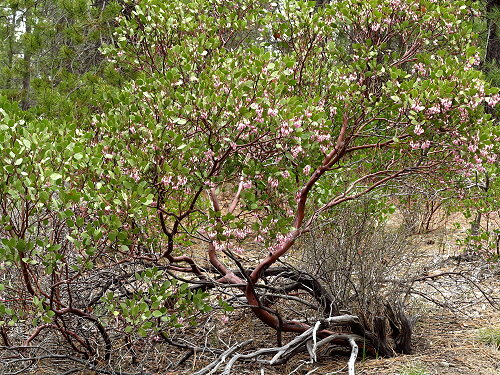 I am fine with walking the road admiring the tall pondersa pines and the manzanita bushes in bloom until it begins to descend into a ravine. No butte in sight, so I head back to camp. 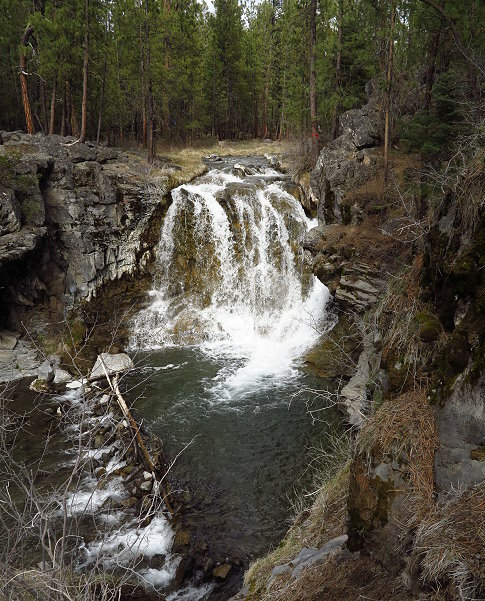 In the afternoon Clifford and I walk around the campground and along the trail downstream where we get a better view of the waterfall. It is really quite impressive. Back at camp, we make hot tea and sit the picnic table for a bit, but it is soon too chilly and way too windy for a fire. After dinner I download and edit some photos while Clifford contines his study of spectographs. As we get ready to head to bed, I notice that it is snowy lightly. Hmmmm…… maybe more snow photos tomorrow! 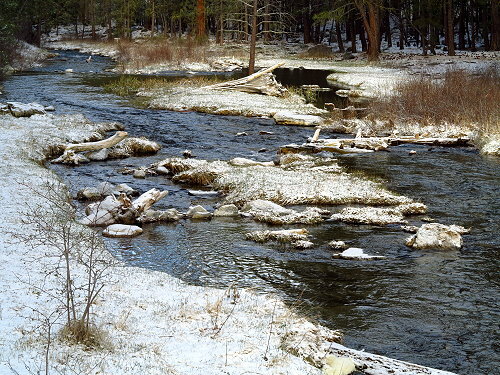 Tuesday April 14: It is 25 degrees this morning with a skiff of snow. 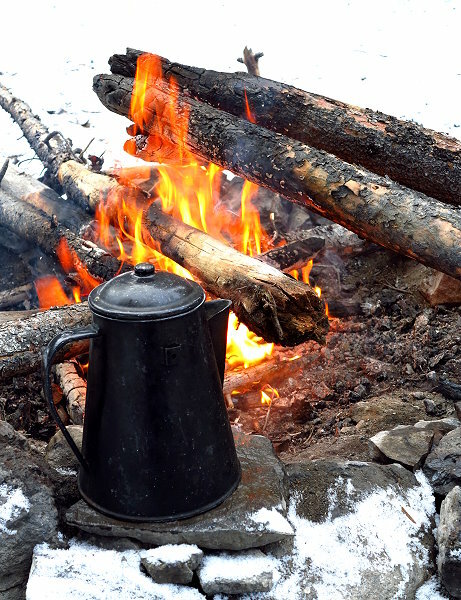 Heat water for my French press, build a great campfire, take photos – it is so delightful! The sun peeks through the overcast now and then, taking turns with snow flurries that come and go. After breakfast I work on the email for the Carnicom Institute and text a Happy Birthday message to my daughter, Merri. She would sure love all these trees that I am seeing. Later Clifford and I go for a drive to buy propane and to explore the closest town, La Pine, and from there we go to the La Pine State Park. 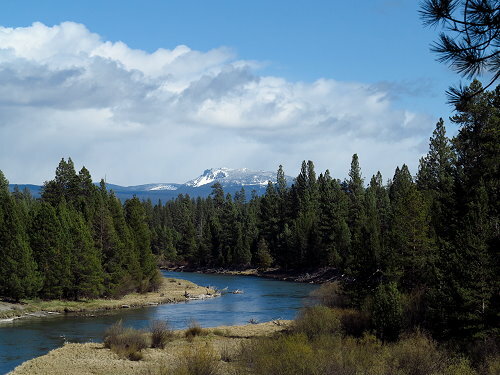 At the McGregor Viewpoint, we see an extraordinary view of the Newberry Caldera with a bend of the Little Deschutes River in the foreground. This is a scene that should be on a postcard, but I have yet to find a postcard with any photo of the Newberry Caldera. Hmmm…. 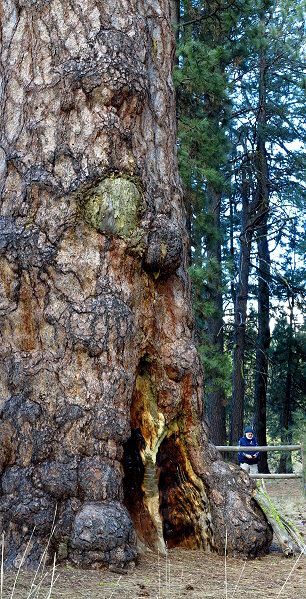 Also at the La Pine State Park is Big Tree: the largest Ponderosa pine on record, over 8 feet in diameter and over 500 years old. In the evening Clifford figures out how to get my hotspot to work so I am able to get on WordPress to upload my Palouse Falls blog and photos. Hooray! 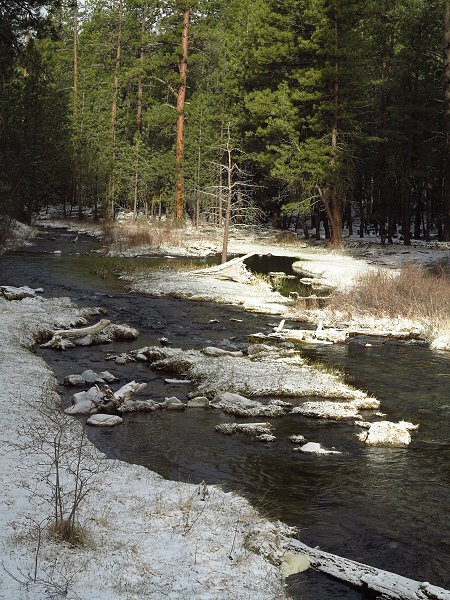 It is amazing to be in a Ponderosa forest so far from the nearest town and still be able to get on the internet. Not sure we’ll always be so lucky, but it is great for the moment.